Camiguin Telecom or short CamTeco suffers. I really had been excited because just now we are testing different providers with different connections. I did just a quick and dirty test. Here is the result. 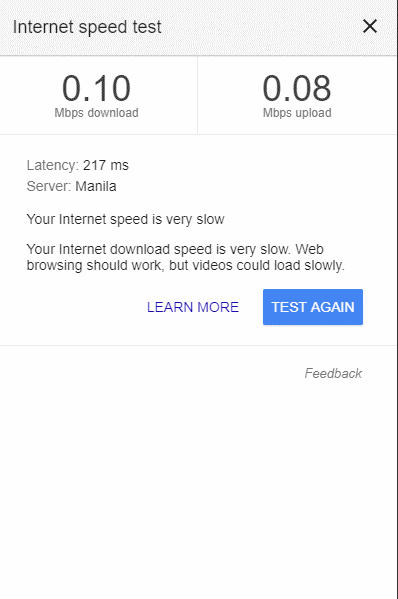 Both tests went towards the PLDT server in Manila. I stayed in the same location and used the same computer. For non-networkers: The Latency informs about the time passed between sending a request and receiving the begin of answer. CAMTECO was 9 times slower than SMART. Mbps download indicates how much date one receives from the Internet per second. Camiguin Telecom was 25 times slower than SMART. And finally Mbps upload informs about the speed of sending data. SMART was 11 times faster than CAMTECO. The excitement vanished immediately. Where is the improvement? Where are the Good News ? As indicated on the little paper on the bill, I went to the local website of CAMTECO. If you are a current customer, you can try 172.18.0.8 in your browser’s address bar. As it is an internal server of Camiguin Telecom, only active customers can reach this website. I report some extracts which do not violate their copyright. CAMTECO is working to restore the quality of service when we started in 1994(1). Visit this site more often for announcements and tips to improve our service. As a small provider we have limited bandwidth to connect you to the outside world(2). With this tips we can improve your browsing speed. We also need your cooperation. (1) Does somebody sell a 300 baud modem or maybe a 9.6kbps box? No, that’s a bit a nasty interpretation. Sorry! (2) This is one of the main problems in the provinces. Data transmission is big business and is big money. (3) This is a bit cheating. What you see in this test is not what you really get. It just shows the possible speed of the cable from your home to Camiguin Telecom. The picture below shows the values retrieved from the local server in Camiguin. The values clearly show capacity bottlenecks and horrible wires. 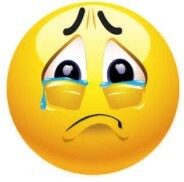 I do not want to humiliate Camiguin Telecom. They have fine guys who know their job. The line-men help customers even during thunder storms. But their equipment ??? CAMTECO suffers clearly from the 3rd World Effect. They install very expensive fiber optics cables from PLDT. But they only use the outer two copper wires. This is a 50 times cost overhead. Nobody on the island knows how to splice these cables correctly. Result: Before upgrading the island’s network, CAMTECO will have to replace all the old fiber optics cables. Again a multi-million peso investment. I wonder who sold these cables and why. A tough salesman at PLDT or maybe an uncle? The new technologies are available in the boom-cities such as Manila or Cebu. 20 Mbps constant – no problem Sir. Out in the province it is worst colonialism executed by the own people. I can understand why young, capable people leave the province. This is called brain-drain. And yes, the cities explode! Lack of transparency. As a customer you are also member of the cooperative. Have you ever received an annual report? OK, there is a website: https://camiguintelekom.wordpress.com/ but last update is from June 30, 2017. I found no financial information. There is also a copy of the phone directory: http://magicboxph.x10.bz/camiguinphonebook/ It shows 605 entries. At the beginning had been a typical 3rd World development project back in 1994. This project had been launched and financed by the GTZ, now GIZ, the “Deutsche Gesellschaft für Internationale Zusammenarbeit”. Initially the GIZ had a really competent local partner, Mr. Genciano “Nandy” Dagondon. But afterwards? Sorry, for once I am fully pessimistic. Camiguin Telecom is not competitive. They can neither match the performance, nor the service, nor the price. Without big investments and without a guaranteed return on investment, they will disappear soon. During the often occurring brown-outs their network is fully off-line. How cam you then call one of the emergency numbers? The two big telcos deliver much better service for less money and they even work during brown-outs. The population’s telecom service consumption is growing extremely fast. Every kid has a cellphone (or two). Landline is the past out in the deepest province. 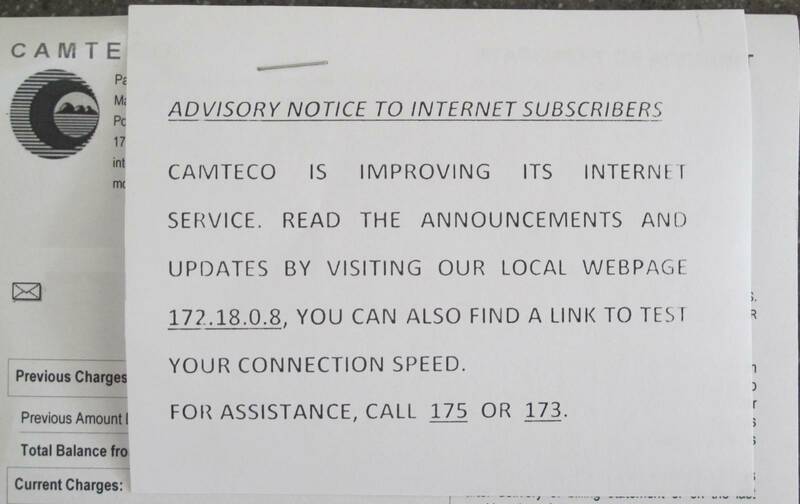 Maybe CAMTECO could be transformed into a government service. Delivering telecom services exclusively to government agencies. This would free up performance for commercial customers of SMART and GLOBE. This would also allow to set up confidential intranet links for the government. And last but not least it would preserve the jobs of many good employees. There will soon be more such changes. What will happen when Gaisano opens? Remove all the little shops and put them inside the mall? When will be the first traffic or parking collapse in downtown Mambajao? Already now the town needs half an army of POSOs to prevent the infarct. Waste water treatment is still unknown. The feces and waste liquids of about 100,000 people flow in the sea. Did someone already count the coli bacteria near the beaches? Boracay did miss 20 years to get the problem in the hands. Now they have a great mess. Who will provide the needed electricity for the new shopping mall, the new resorts and the growing number of locals using electricity instead of wood stove and candles? I say it in my own language: Après moi le déluge. Désolé. Ah yes, the old internal speedtest trick. 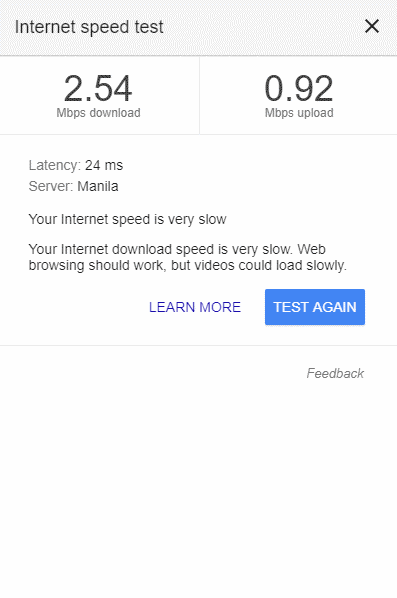 I have noticed recently that Globe home internet services have become far better in Camiguin, when we were staying at Mountain View, we regularly had speeds in excess of 5Mbps (tested) and some of my friends who reside on the island are also receiving speeds around that mark. The issue is that not everywhere on the island can get that yet, who knows how long it will take Globe to increase their coverage, both Globe and Smart seem far too focused on the mobile market where they can sell easily data for extortionate prices. Hi, I appreciate for the recognition of my effort in the Camiguin Telecommunication Project. Actually, I saw this post last year. I should have posted an answer to this post because those above updates were really my activities to help CAMTECO back to it’s former glory. However, political forces came into play when the Chairman of the Board, a pioneer in the Project in 1990s, resigned. The neophyte Chairperson who admittedly said “I need your help to familiarize myself because I’m not familiar”. However, she turned 180-degrees in May. She submitted a Position Paper recommending turning over the telephone network to the provincial government and she blocks the Recovery Plan which include the following: Seeking Technical Assistance from PLDT to re-engineer/re-design CAMTECO’s poorly-designed Internet system (raised with PLDT/Smart in Davao City) so that CAMTECO can offer PLDT-like Internet quality at reasonable cost, restoration of telephone service in Tupsan, Guinsiliban, Sagay and Lawigan areas, setting up a Internet-based Telephone System which will eventually replace the legacy telephone exchange, putting up CAMTECO’s local cellphone network, and many more.). I submitted a Rebuttal Paper which I intend reach the coop members. However, it seems the members already lost interest. So, everything ceased. At present, I’m working on a VoIP (Voice over Internet Protocol) application by myself. This has a nationwide market which could benefit CAMTECO. Finally, the blog Camiguin Connections is my personal blog. It’s not connected with CAMTECO – no financial nor annual report.